Noting down a few for fear that I’ll forget otherwise.. The other day, on our drive back from school (a lot of these happen in the car for whatever reason), I was trying to explain the concept of infinity to her. I was saying you could count and count and never get to infinity. So she was like ..what if I count for a year 5 years etc .. what if you count.. and I said yeah even if I count and you count we will never get to it..She then goes..what if Barrack Obama counts..Such is her faith in the president. You can hence also imagine her disappointment when she woke up to Trump when we were both excited about a ‘girl’ becoming president for the first time. On marriage, she has wavered. First she’d asked what marriage was and I said it is about finding someone you like and someone who is your favorite person and spending your life with them. In thus explaining, I was careful not to use gender and trying to give her a broader picture..So she says I’ll marry Anoushka, Anoushka is my favorite. Since then she has gone through the I want to marry amma please phase and has now arrived at I don’t ever want to get married, or go to Uni or leave Acha and Amma ever again. Funnily, we haven’t had the Electra phase yet despite her absolute adoration of her father. I realize now that until he’d come into our lives, I had no clue of the bond between Chakki and Mia. I have of course professed eloquent here and elsewhere that I’ve felt so fortunate for the Chitta and Chittappan presence in Mia’s life..But some things you have to live to really understand. That you can miss someone (with a tug at your heart) even before ever meeting him and that you can tear up just talking about him..That such love is even possible..all new to me. I’ve also gotten a hint of how much fun this valiyamma role could be when compared to parenting – none of the responsibility but the same sense of pride in and love for this littlest thing. I’m not sure I can do justice to this but I have a big Abhay post pending and then we’re traveling to India so we need to be caught up in hurry. When I think of you, the first thing comes to mind is wise. I try to push it back, because you’re also incredibly fun and smart and talented and all those things that could easily apply to a 4 year old girl. It almost seems unfair to tag this wisdom attribute on you. It is true though so to give its due..you are such a seeing knowing perceiving child. I guess the rest are things I’d expected or seen in you raising you, but the wisdom still catches me by surprise sometimes. And back to the funner parts that make you – the many Igi-isms which deserve another post..there isnt a day when Vin or I will catch each other during the motions of our day ..in the kitchen..driving back from work, at work and say something funny you mentioned. Like I said they deserve their own post so let it be. You really like swimming and you alternate between enthusiastic and reluctant with the violin. We had a serious low last year about violin (or I did, you didnt even notice) struggling with the question of whether to keep at it. It isn’t that you dislike it but the daily practice and rigor of learning an instrument is too much at ..what 40 months? (yes to emphasize the smallness) We are over that trough though and most days you’re excited to show Acha what you learnt and of course you’re a happy performer. Practice sessions are easily masked as recital, audience and applause and all that included. You’re super good with puzzles and you’ve just started writing. In fact the other day you made and illustrated a book for me – story all your own – called the happy turtle. We finally got you all moved out to a Montessori and you’re thriving there. Really. But we dont have a lot of time for pause coz the elementary (school) question looms large. Anyway that’s our problem. You are such a social kid. Part of that might be a function of how you’re growing up. Surrounded by friends (ours and yours..with many evenings that turn into late nights resulting in your getting a tardy mark for school next day) and with frequent visits from both sides of the family. Some of it is just you though, even at school you veer towards activities that involve one more person. For the 4th birthday, we did a painting party at crackpot. This was the first time where the party was all-kid but even then we had enough of our grown-up group hang out and munch and help and then inevitably the party spilled into an after-thing at Fa’s which lasted the whole weekend. I’ve realized this is the most kiddie-party thing I can throw. Our grown-up group is too much a part of even your life that you aren’t in any luck of getting a pure kids-only party. Until some day you walk up to me and demand otherwise. You continue to be good with food and I wont pretend that is a coincidence or make any surprised/ false_humble noises. I tend to eat (Relatively) healthy as well and I do still manage to put home cooked dinners on the table most days so you’ve grown up eating (again, relatively) healthy food. Almost invariably, you even pick fruit over candy when given that choice. You’re pretty active and you really enjoy the outdoors. You’ve done a few hikes with us already and you get from Acha the need to finish the hike, get to the top, and hopefully you get some of the smell flowers and jump in the creek on the way from me. Either way that is one of the few things all 3 of us equally enjoy. You also continue to be Acha’s little helper – in the garden and around the house – and take a lot of pride in that role. You’re also happily a lot more independent now. So the times and things for which you absolutely need a parent are lesser. And while on most days I’m happy that I can kick back and sip on my wine without running to change a diaper (last time was more than 2 years back..) one part of me does tell me I’ll start missing the dependence soon. You’re a joy and delight my baby and it is such a privilege (well, check back in a year) to raise you. I spend far too much time worrying about things that are eventually either of little consequence or not as big a deal as I make of them in my head. If the subjects of my worrying – where they are real people – knew I’m sure they’d agree. It all eventually turns out fine. But my head is always this jumble of what ifs and what woulds and so on. Just need some quite. I wish I could say Achan’s visit was all I wanted it to be. That I was able to spend a lot of time with him and have long conversations about everything under the sun. Truth is, with Igi and work and the business of life in general those are lofty aims. For me it was joy just to have him here. To wake up and go to bed knowing Achan is right here under the same roof. And of course Igi and Muthassan bonded so beautifully. This was prolly the first time she really missed a grandparent after he/she left. 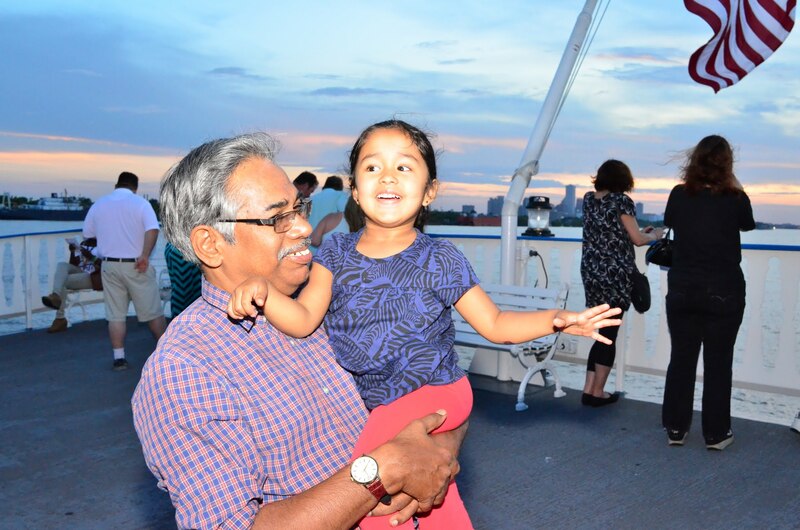 Most days he’s the one who put her to bed – telling her stories – perunthachan, hiranyakashipu and even Gandhiji and Washington – and singing her old malayalam songs – to the extent she’d learned some of them by the time he left. They’d also go to the park together, do puzzles together, play mom and dad (very amusing this). I realized Achan was better than me at drawing (isn’t saying much I agree) when I saw the doodles he’d make for her. They were mostly in their own blissfulm muthassan-Igi world but I felt soo soo fortunate just to watch from sidelines. 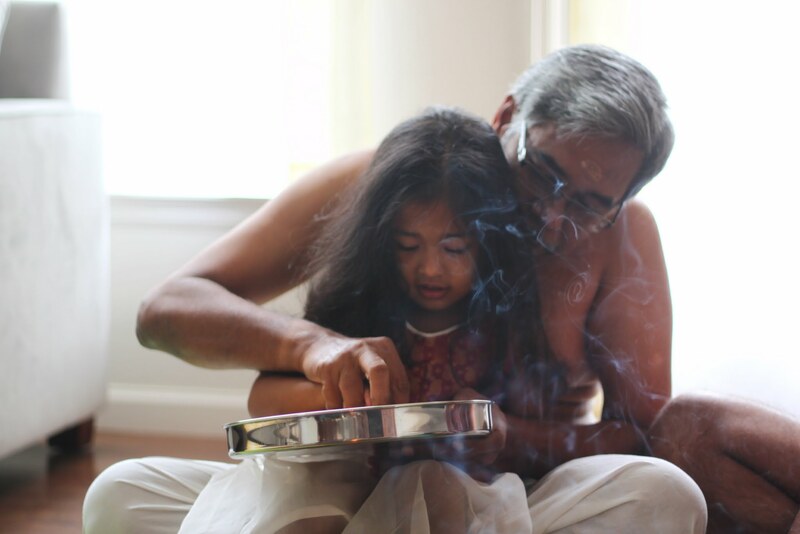 I’d always wanted Achan to be the one doing her vidyarambham and we managed to squeeze that in on the day she started new school (which in itself deserves another post). 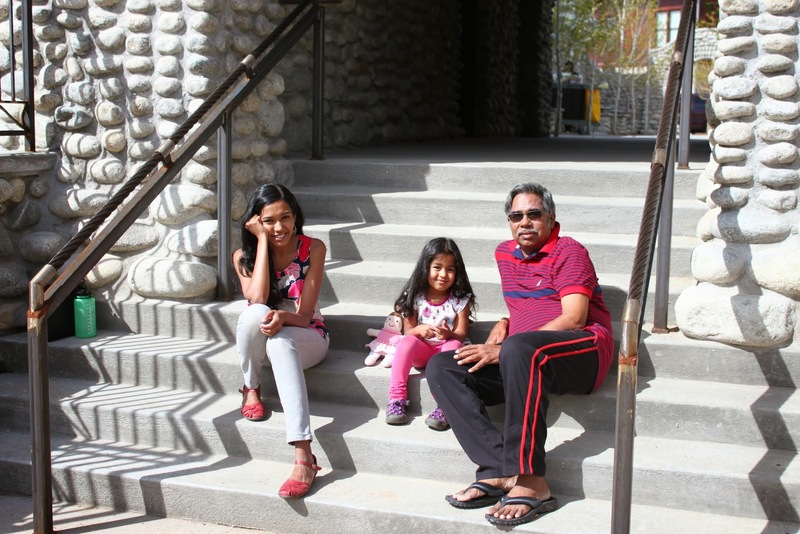 The weekend after Achan arrived was our Vishu potluck. I think Achan had a good time, although he was somewhat jet-lagged. Being the resident karanavar he also did the kaineetam honors. By the time he left he’d met and hung out with our friend circle a few times (Vin and I also managed to score some great meals coz everyone was having him over) and gotten to know everyone so well. We did a short trip to Buena Vista and a bigger one with Chakki and Alexy to New Orleans. He also visited Grand Canyon with Chakki and Alexy. So yes, it was busy and packed. In fact our weekends were so busy it was his last weekend in town that we actually hit Boulder. I guess it is never perfect and never how I plan and want it to be. But Im incredibly fortunate and grateful that our parents are able to do this. I can’t wait for him to come back, I’m sure Igi cant either. As far as birthdays and parties go, despite the fact that just finished my 33rd, I’ve been very fortunate. Some would attribute it to having an A team – composed of Chakki and then Vin too in the later years – who keeps upping the game every year. There must be something about Leos and celebrations and larger than life surprises. I cant remember a birthday in the past decade on which I haven’t cut a cake or had a party. To the point that come the eve of March 17th I’ve learnt to look nice and presentable, maybe even brush my hair even if we’re lounging around in jammies. This time was even better, thanks to my girlfriends who did a cake and surprise and gift etc a whole week earlier, catching even surprise-savvy me off my guard. And then on the eve itself, Vin made me eggplant steak with a feta and tomato salad for dinner. (And then I made real dinner, you know mallu fish curry and rice – for him). S send me a lovely card – I’ve almost started taking her thoughtfulness for granted these days. But really who sends cards and notes in these days of fb? I got a whole series of gifts from T through the b’day week! On the 17th – after having me believe all day that we’re not going out, to the point that I was slightly miffed by the end of day, what with everyone asking me what my plans are – Vin comes home having dropped Mia off already at F & Rs place and with a reservation at Leaf, a vegetarian restaurant in Boulder that I’d had my eye on for a long time. I prolly sound so vain now, counting off my surprise events and gifts (which while we’re at it, has to include the handbag that chakki sent too). The reason I wanted to quickly put this down is to capture how overwhelmed and grateful I felt by the end of day. Yes, some of these are shallow pleasures – food, clothes all that, but I’m fortunate to have so many people who even at 30Fing3 celebrate and make me feel special. Isnt that something? Many things actually?